12 hours, 6 hours, 10K or 5K! No matter what you run, it's going to be an all-day running party! 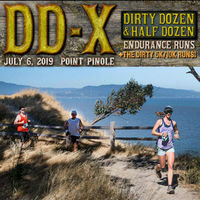 Come join us at Point Pinole Regional Shoreline for a different kind of race! From 7:00 am to 7:00 pm, the running party won't stop! Don’t think you’re ready to run all day, but still want to come out and run? Sign up for one (or more) of the The Dirty 5K and Dirty 10K to show your support of those brave souls running for 6 and 12 hours!